It is clear that we are currently living in the age of the customer, with customer expectations at an all-time high. Online retailers have set a high standard by engaging customers before, during and after each interaction. The big question is: Can service providers in industries such as banking, insurance, healthcare, and government rise to, and possibly above, this standard? Furthermore, why shouldn’t opening a bank account or filing an insurance claim be as easy as buying a book online? This white paper answers these questions with a tool to help leaders reinvent business operations in the age of the customer. 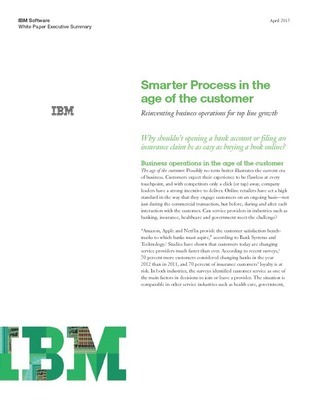 Inside, explore this methodology and find customer case studies that bring it to life.